This week's sketch at Freshly Made Sketches is a fun, yet challenging one. The design team did a fabulous job showing off some beautiful ways to use it, so be sure you check the blog to see them all. For my card, I kept things pretty simple. I am always in need of children's birthday cards at the local shop that sells my cards, so I have been trying to focus on making up some for that. I pulled out some retired designer paper and my favorite retired stamp set for this one. It came together pretty quickly and I think it would be just perfect for a little girl. I hope you'll find time to join us this week! This card just makes me smile! Absolutely adorable in every way - love it! Oh so cute.....Cassidy is just learning what elephants are....and what a pretty purple one you've got here! So darn cute Rita! Love that elephant!! Perfect for a little girl indeed! The elephant is so cute holding the flower. What a sweet card, Rita! What a cute little card Rita. Love the little elephant! This is such a cute card Rita! I love the way you've used that elephant and the dsp works beautifully with it. This is so adorable! A big purple elephant with a flower on it's nose! What could be better than that? Rita, this is just precious and perfect for a little girl's birthday. So I think you hit the nail on the head with this one. If it were in boy colors, my nephew would be all over this one. He loves to make elephant sounds and mimic the elephant trunk. Love your card and hope all is well! This card is too cute! I love the flower the elephant is holding! 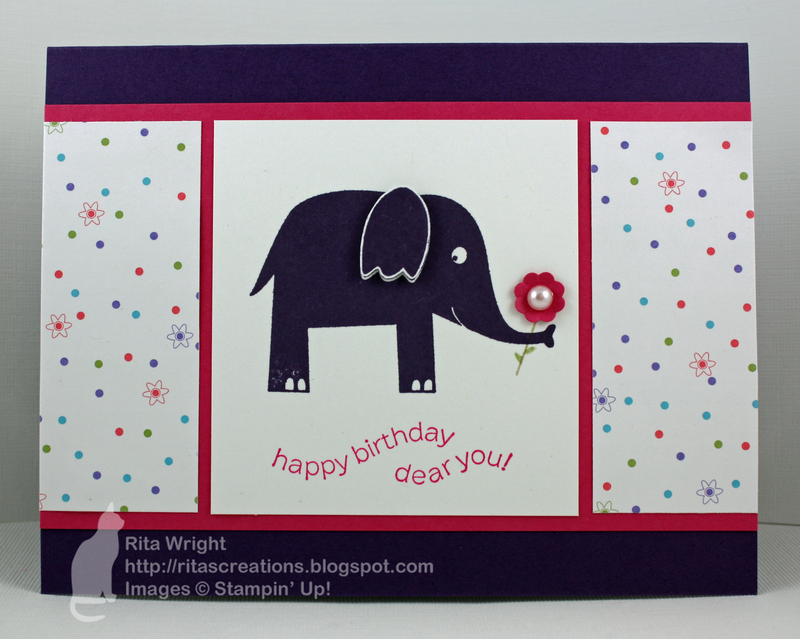 Love this card Rita ... That elephant has always had that cuteness factor and I love that pretty polka dotted paper too! So cute! Love the little bloom in his trunk!